So when I saw Emi's review of this product, it immediately made me pretty excited. Prestige Total Intensity liners are my absolute favorite, so when she said that it might even be better... I started looking for them right away. I was really excited to see these show up at Walgreens, Walmart and Ulta near me. At Walmart, they were packaged in a paper backing but at Walgreens they only had just the pencil and cap, not even a plastic shrink wrap seal (gross!). I was pleased to see that they had quite a few colors, especially some shades that are not common for drugstore liners- taupe, beige, light blue! Initially I brought home only 004 Taupe and 010 Silver. I liked them so much that I bought 003 Brown later on. Taupe is a light taupe with very fine shimmer specks that looks completely matte once applied. Silver is stunning, a bright silver liner that is so bright and shiny, it looks almost like white gold- so eye catching! Brown is slightly shimmery with copper sparkle. Brown. My eye looks a little red here, not due to the shade but due to eye rubbing, bad habit. This shade does not look so warm in real life. Taupe. A nice shade, but I wish it were a tad bit darker because it kind of looks like when you don't remove your makeup properly the night before and then the next day you have grey smudges around your eyes. Silver. My favorite out of the three. So beautiful! Like streaky like a lot of metallic eye products, but a beautiful fine shimmery silver. So pretty! I like the formula on these a lot. Really creamy, but glide on like gel. They are very long wearing for me, lasting all day and only budge if I rub my eyes like an idiot. My eyelids are not very oily though, so your mileage may vary. The shade Brown definitely lasted the longest on my arm swatch, while the Silver faded the fastest. It's the same sort of pencil as Milani Liquif'Eyes, Prestige Total Intensities and Urban Decay 24/7s, that dense plastic-y 'wood' that sharpens very well and allows you to get a crisp point. The best part of these products? 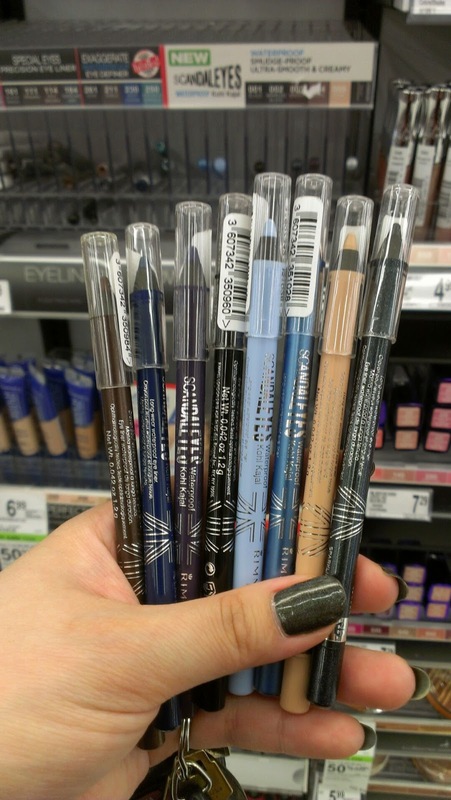 They're among the cheapest eyeliners available these days. At Walmart, they were $3.79 in my area, at Walgreens they were $4 and change. At that price, I can definitely afford to buy all the colors that catch my eye! I think that this may very well become my favorite liner, especially since the Prestige displays I see always tend to be picked over. What's your current favorite eye liner? Have you tried this new Rimmel Scandaleyes yet?